Taking nutritional supplements seem to be the accepted norm for health enthusiasts and fitness junkies. But what do they do for our bodies? And do we really need them to maintain a healthy body and support our fitness regime? In this article, we will examine what nutritional supplements can do for our health and fitness, along with the specific effects of certain key supplements. We will also look at how to take supplements in order to receive the maximum benefits. Nutritional supplements can support different functions within the body to strengthen overall health and support your fitness routine. For example,cell nutrition products support optimal cellular health to allow your cells to perform at their best for you and protect them from illness and chronic disease. Amino acid supplements, on the other hand, aid with muscle growth and are essential for those wishing to build muscle, increase performance or enhance recovery as part of their fitness regime. Even if you are eating a healthy, balanced diet, experts say it is virtually impossible to get all the nutrients our bodies need from food alone. This is due largely to the way our food is produced and handled these days: from being gown in soils which have been depleted of their minerals over years or decades, to being transported for long distances and stored for long periods of time before it eventually makes it to our plate. Add this to our hectic modern lifestyles, and even the healthiest diet isn’t sufficient any more to deliver our bodies the vitamins and minerals they need. Vitaminsare organic substances which are found in food and support body functions and general health. Common vitamins are Vitamin C, Vitamin D and the B group of Vitamins. Minerals are often confused with vitamins as they are also found in food and have positive benefits for human health. As opposed to vitamins which are produced by plants and animals, they are inorganic substances and found in the soil or water. Minerals which are important for nutritional health include iron, calcium and magnesium. Specialty supplements describes other types of supplements which contain components which are beneficial to nutrition, such as omega-3 and fish oil. Herbal supplements are plants or components derived from plants with purported benefits to health such as Echinacea, ginseng and garlic. Within these categories are various individual supplements, each with specific benefits to health. Iron is an important mineral which is found in food, but many people, particularly women are found to have deficient iron levels in the blood. Iron is important because it is essential to the proper functioning of haemoglobin, the protein responsible for transporting iron in the blood. Iron deficiency can lead to many health problems, some severe. Magnesium is also a mineral, and is well tolerated by most people while having many health benefits. Some of these benefits include improving sleep, reducing anxiety and treating conditions such as constipation. Vitamin D has long been shown to be critical for good bone health, however studies show that the majority of people are deficient in this crucial nutrient. Other benefits of vitamin D are thought to include lowering the risk of cardiovascular diseases, diabetes, some cancer and autoimmune diseases. Calcium is another mineral, which is well recognised for its importance to bone health. It also has a range of other health benefits including assisting in the treatment of some cancers, hypertension, and with weight management. Certain segments of the population are particularly at-risk for calcium deficiency, such as those with lactose intolerance, vegans, and post-menopausal women. Probably the most commonly used form of nutritional supplement with around 40% of adults in the US taking them, what exactly makes up a “multivitamin” supplement can vary from product to product. However, it is essentially a combination of vitamins and minerals, with some products also containing herbs, enzymes and probiotics. Fish oil is another commonly taken nutritional supplement, and for good reason. The Omega-3 fatty acids found in fish oil have a range of benefits, including improving energy levels, reducing inflammation and aiding with overall wellbeing. Vegan-friendly Omega-3 supplements are also available. Adrenal boosters can help to address hormone imbalances. Hormone production can become deficient for a variety of reasons, and adrenal boosters can aid in stimulating the adrenal glands to assist with additional hormone production. Probiotics are so-called “good” bacteria which are important to our health because they aid with digestion, strengthen the immune system and even combat other less beneficial forms of bacteria. Although these are naturally occurring in the gut, supplementing by taking probiotics is often necessary, particularly if you have or are taking antibiotics. Who Should Take Nutritional Supplements? With this long list of positive benefits, nutritional supplements obviously have something to offer for pretty much everyone. In particular, there are specific groups within the population which may be recommended to take supplements to address health issues or promote better health and wellbeing. What Are The Most Important Nutritional Supplements? With so many supplements available and so many minerals and vitamins necessary for our health, people often want to know if there are certain supplements which are more important than others, or that should be prioritised.You should of course consult with your doctor as to the specific supplements which may be necessary for you, and those which could be particularly beneficial. Multivitamins are a good place to start if you are not ready to commit to a comprehensive daily regime of different vitamins. Taking a daily multivitamin in combination with a healthy balanced diet, will go a long way to ensure you get the vitamins you need to support healthy body processes. Because multivitamins can vary in composition, you should make sure your multi contains Vitamin D, Vitamin B12, and preferably calcium and magnesium. Fish oils are also highly beneficial, and could be considered at the top of the list of the most essential supplements. Other key supplements to consider would be Vitamin D, calcium and iron. Does When You Take Your Supplements Matter? Timing supplements is important to ensure you get their full benefit. Certain forms are best taken with food for optimal absorption, whereas others should be taken without food for best effect. As a general rule, anything which you would like to act as a nutrient in your system (vitamins, minerals, amino acids) should be taken with food. This is opposed to anything which you would like to act medicinally in your system such as herbal or homeopathic remedies or Chinese herbal formulas, which should be taken without food. Furthermore, not only should vitamins be taken with food, but some are best taken with certain forms of food depending on their solubility. Fat soluble: meaning they dissolve in fats and oils and are stored in the fat tissues in the body. Common fat-soluble vitamins include vitamins A, D, E and K.
Water soluble: meaning they dissolve in water and are generally carried to body tissues but are not stored in the body. Examples are vitamin C and B-group vitamins. Fat-soluble vitamins will be most effectively absorbed by the body if taken with some form of fat. Therefore, they should be taken not only with meals but with a meal which contains some form of fat or oil for optimal absorption. This is the case for multivitamins as well as specific vitamin A, vitamin D or other fat-soluble vitamin supplements. Iron, on the other hand, breaks the general rules and is actually best absorbed on an empty stomach, but in the presence of vitamin C. A great way to achieve this is by taking your iron supplement with a little vitamin C! Other types of nutrients will have maximum benefit if taken at a certain time of the day: those aimed to enhance sleep quality will obviously be most beneficial if taken a short time before you go to sleep. Check this infographic for an overview of the best time to take your nutritional supplements. 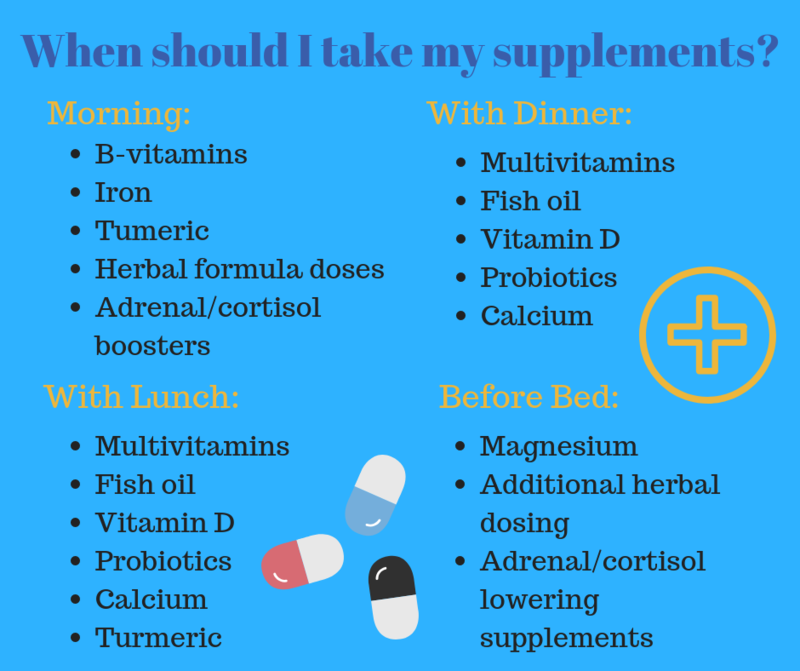 For those supplements mentioned more than once, this means you have the option to take these at either of those times of day. When taking nutritional supplements there are a few more considerations to be aware to ensure you get the maximum benefits. As with anything you put in your body, there can also be risks associated with supplements if you do not use them correctly. Nutritional supplements are not food and should never be taken as a substitute for foods. As the name suggests, supplements are designed to add to your diet to make sure you get all the nutrients you need, not be a part of it. Seek medical advice. As with anything relating to your health and fitness, always consult with your doctor regarding the nutritional supplements you should be taking. The appropriate dosage of certain supplements, vitamin D for example, varies greatly from individual to individual depending on their own needs and physiology. Always buy your supplements from a reliable and verified supplier to ensure quality supply. This is not only important to ensure you actually receive the nutrients that you buy, but in some case avoid ingesting harmful substances. This is especially important for fish oil and Omega-3 supplements, as low-quality examples of these may be contaminated with heavy metals. Follow the recommended dosage: taking more than the necessary amount of any mineral or vitamin will have no added effect and will be at best a waste of money, and at worst mean you suffer side effects such as vomiting or diarrhoea.